Refined and regenerated, the Hilton Boston Downtown has recently completed a guestroom renovation offering new accommodations within a classic hotel. 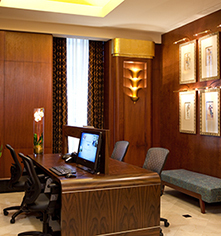 Built in 1928 as Boston's first Art Deco skyscraper, this AAA Four Diamond hotel is perfectly situated in the heart of downtown Boston's Financial and Historic Districts putting guests in the center of Boston's economic and social hub. 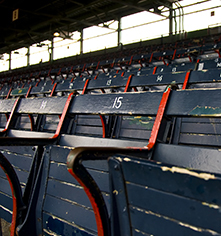 This historic hotel is just one block from Boston's Waterfront, and walking distance to the New England Aquarium, Faneuil Hall Marketplace, and the Boston Children's Museum. With amenities, this Boston hotel provides guests with a comfortable and convenient travel experience. Guests can relax with a book in the library or stay connected at the 24-hour Executive Business Center offering computer, fax, and copy services. 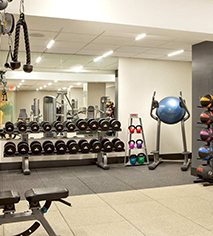 Enjoy the brand new, 1,500 sq ft fitness center featuring state-of-the-art LifeFitness equipment. Guests have 24 hour complimentary access with their room key.